Ulysses Grant president of the U.S. Potato Famine causes Irish immigration to U.S. Questioner: You have been leading a crusade against blind belief, superstition and organized religion. Would I be wrong if I say that in spite of your verbal denunciation of the Theosophical tenets, you are fulfilling the central fact in Theosophy? You are preaching real Theosophy. 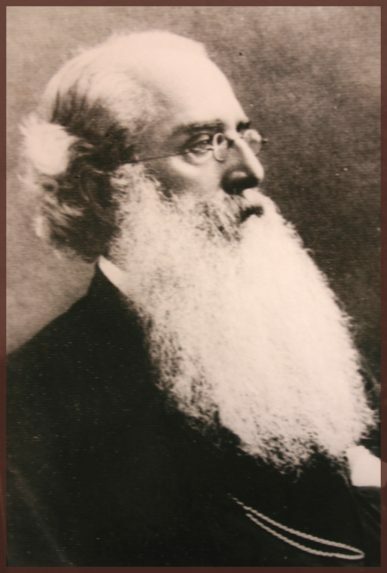 There is no real contradiction between your position and the position of the Theosophical Society whose great President first introduced you to the world. Krishnamurti: …in discussing the Theosophical Society – of course, you understand, I am not concerned with it, I am out of it completely. You want to know if what I am saying, teaching, and the central fact of Theosophy and the Theosophical Society, are the same. I say obviously they are not. You would like to patch it up and say we have produced you and therefore you are a part of us, as a baby is part of the father and mother. That is a very convenient argument, but actually the boy is entirely different from the father when he grows a little older. Surely, Sir, when you are becoming more and more, spiritually climbing the ladder, you are denying truth, are you not? Truth is not at the top of the ladder; truth is where you are, in what you are doing, thinking, feeling, when you kiss and hug, when you exploit – you must see the truth of all that, not a truth at the end of innumerable cycles of life. To think that you may be a Buddha some day is but another self-projected aggrandizement. It is immature thinking, unworthy of people who are alive, deeply thoughtful, affectionate. If you think that you will be something in the future, you are not it now. What matters is now, not tomorrow. If you are not brotherly now, you will never be brotherly tomorrow, because tomorrow is also the now. 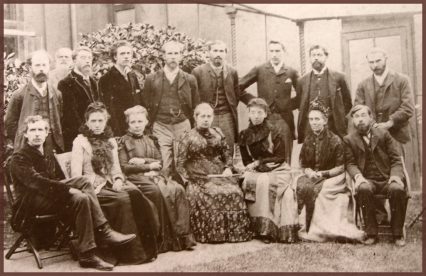 In the mid to late 19th century there was burgeoning interest in matters paranormal. 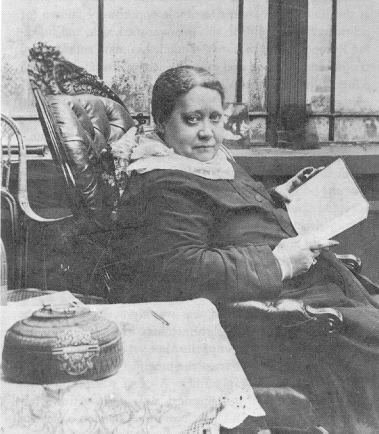 Séances, psychic phenomena, telepathy, thought transference and clairvoyance were subjects of heated discussion. Masonic, Rosicrucian and Cabalistic groups of generations earlier flourished. 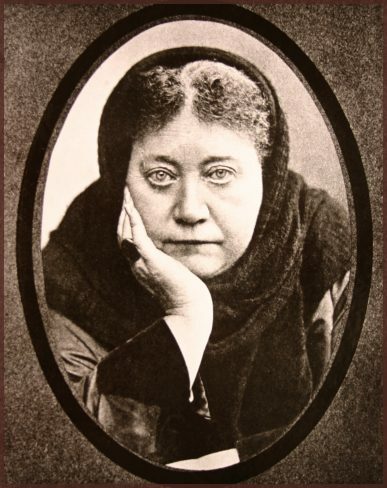 Into this ambiance the Russian Helena Petrovna Blavatsky, H.P.B. as she was called, found her way to New York where she became the first Russian-born woman to become a U.S. citizen. 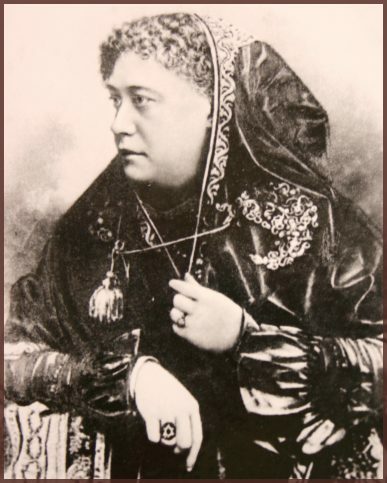 Born in Ekaterinoslav in 1831 and of noble heritage of the Dolgorukov and von Hahn families, she married, at age 17, General Nikifor Blavatsky. Shortly thereafter she left him to travel alone through Russia, Europe and the East in pursuit of arcane knowledge and the esoteric brotherhood of Hidden Masters. She was at once exotic and notorious, not the preferred image of the 19th century woman. Her massive volumes Isis Unveiled in 1877 and The Secret Doctrine in 1888 attracted many artists and intellectuals to the Society, including poet W. B. Yeats, artist Kandinsky, composer Scriabin and George Bernard Shaw. Her meeting with Henry Steel Olcott seemed fated. He served in the American Civil War and been part of a three man investigatory body looking into the assassination of Abraham Lincoln. As they strolled the grounds of the Eddy farmhouse in Chittenden, Vermont, she with ever present cigarette, he with his pipe, they formed a lasting friendship. Together they examined the unusual events taking place in the farmhouse. Sightings of ‘spooks and ghosts’ were creating a stir in the American press.